A couple of weeks ago saw me paying a visit to a Diptyque counter because I have a soft spot for their fragrances and candles and I saw from here that there was a 10 candle set released this year. Excuse me? 10 candles? Let me at them please! Unfortunately, I found that it wasn’t sold here which left me feeling rather disappointed. But before I could leave the store, the cunning SA at Kens Apothecary BV2 told me that what they DID have was a 5 candle set. I spun around so quickly, I might have given myself whiplash. Part of the Diptyque Christmas selection is a set of mini candles that was released to commemorate Diptyque’s 50th Anniversary. Each candle represents a scent created in each of the 5 decades commemorated, and they are the mini 35g candles with an approximately 12 hour burning time. They come in a beautiful black and gold box and I picked it up because it’s a great way to sample a selection of Diptyque candles to see which I might like. Thus far, my experience has only been with 34 and whilst I like it, I wanted to see what else was on offer. If you have never tried anything from Diptyque but are wondering what the hell the hype is all about these luxury scented candles, then the box sets are the way to go. If you can get hold of the 10 candle set, all the better! Diptyque releases a small selection of holiday candles each year and this year, they drew on their Oriental travels to conjure up scents of the East and the Orient. 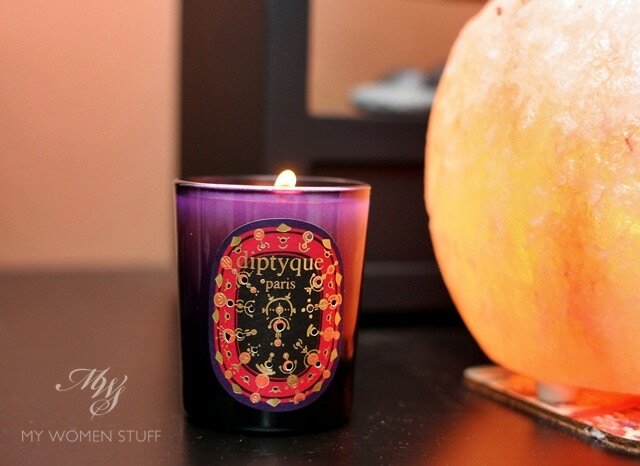 Expect musky spicy florals that smell exotic and perfume your room with the wonderful warmth of dried spiced flowers. The 3 scents available are Encens des Indes (Indian Incense (purple jar)), Orange Chaya (Orange Chai (orange jar)) and Ecorce de Pin (Pine Bark (green jar)). Fittingly with the season, the scents evoke feelings of warmth and comfort and fit well in a cool setting. A little heavy if burnt in warm weather, I felt. Indian Incense, which I have comes in a deep gilded purple jar that looks suitably festive. Makes me think of Deepavali more than Christmas, to be honest. The scent of the candle in the jar smelled rather floral, but this is when I learned that a burning candle can quite often smell totally different from the wax. When burnt, the scent is that of spicy roses and flowers. There is a depth of scent that perfumes the air and the spices takes away that sweet edge of flowers, while the flowers take away the bitter edge of burning spices. The combination is quite exotic and never one I’d have picked out for myself, so I was very pleasantly surprised! I do find however, that the 70g candle which has about 24 hours burning time isn’t quite big enough to perfume a large area. So, for my living room or even bedroom, all it leaves is a delicate hint of a scent after burning it for about an hour. I did find it strange for it not to be very strong. Somehow it doesn’t fit with the appearance and description of the candle. You’d just expect something named ‘incense’ to smell strong or even choking. The light, almost delicate scent is strangely incongruous. The mini sizes aren’t usually sold and sometimes are given out as GWP or come in seasonal sets but they are the best way to know if you’d like a particular scent. Since they are so small, don’t expect them to fragrance a room properly. There are some ratios you’d have to consider to derive the optimum pleasure out of your scented candles, but they will serve you well enough in a small room like a bedroom or study or you can burn a couple of them together and that might create sufficient intensity. Stronger scents like Baies, Figuier or Ambre may work in a larger area as they are by themselves, quite strong. Thé (Tea) and Jasmin are lighter. I’m not burning them yet though. I’m saving them up for something special and when that happens, I hope to remember to share 😉 Consider it then my figurative celebratory champagne. 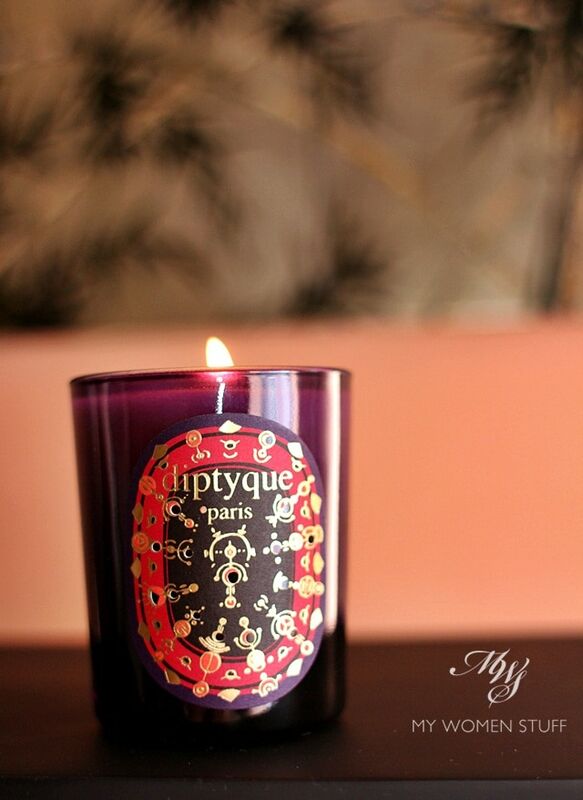 Do you have a favourite Diptyque candle? Have you been tempted to try one of these luxury candles? I love scented candles and I make no apologies for loving these luxury ones too. I don’t have a favourite yet but I do like the nice clean scent of 34 that smells lovely whether on body or in the home. I even splurged on the Hourglass Diffuser in 34. Also waiting for the ‘event’ to open it 😀 Share your fave Diptyque home scents with me – I’m learning! That holiday candle looks interesting. I would totally grab one just for the sake of having the beautiful purple packaging. But I’ll need to wait till I settle into my own place in KL first hehe. Omg I like how that purple candle already, so regal!!! I have not tried any from this brand, and I think it is about time!!! Woohoo! Ahh thanks for pointing it out Effa! I didn’t realise Space NK shipped here too and you’re right they do still have the 10 candle set in stock. Gosh, I’m tempted, but I shall have to be good 😀 I took a sniff at the 3 Candle coffret but I didn’t like the scents in that one. Those are bigger candles though. LOL!! If you can get the mini candle sets, get those – either the 5 or 10 candle set (Apparently Space NK has the 10 candle set and it ships internationally!) so you can try a bunch of different scents and figure out which you like. I find it so different when it burns and when you sniff it that it’s just not accurate. I LOVE scented candles. Ever since Tine got me started on Glasshouse, I’m completely hooked. I had a bad experience with one but the customer service was top notch and I’m a loyal fan for life. 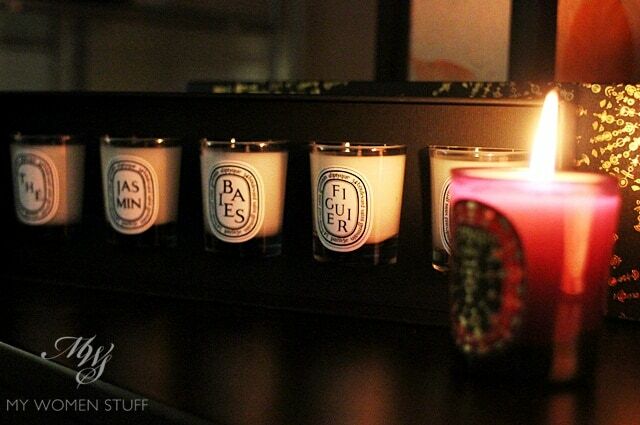 Wow, I like the Diptyque 50th Anniversary 5 Candle Boxed Set! 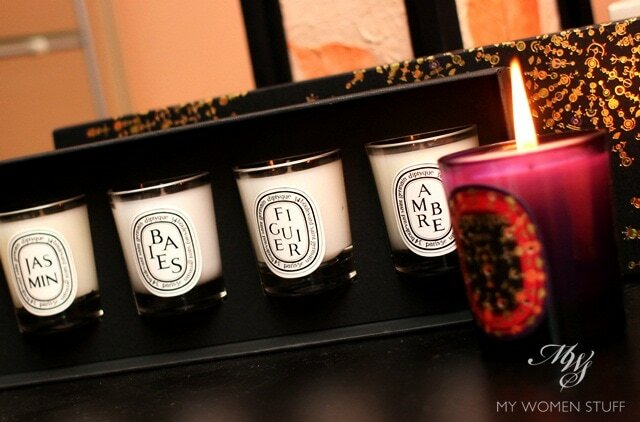 I learnt about candles and this brand from MWS. Haha, too bad my household is just too Cina. Maybe one day when I have my own cosy corner, I will try the candles. I just have a teeny weeny concern – will the smell linger for a long time? Was thinking just in case if I dislike the smell or if it smells good but linger for too long, the smell might turn stale? Ahh that’s a lot of Diptyque! I skipped the set because I wasn’t sure I’d like all of them, but I did get the Pine Bark one as a present, and the Indian Incense one is on my Christmas wish list. I hope I’ll find it under the Christmas tree! I think SpaceNK ships internationally and they carry Diptyque 🙂 However, I don’t recommend buying them without first having a sniff to see if you’d like them because you may not and if you don’t generally like scented candles then it could seem just too pricey. But for scented candle lovers it’s great 🙂 I don’t like Yankee Candles either. I find them far too strong and you’re right, gives me a headache too! I like those with natural scents too like the ones from Ecoya and Glasshouse. Really nice!